Clarets boss Sean Dyche isn’t concerned by the pessimists that continue to question the club’s Premier League credentials. Instead, the North West Manager of the Year is embracing the seemingly perennial ‘underdog’ tag that the Clarets have adopted. An 11-game winless run in all competitions didn’t do much to alter opinion on the outside, but Dyche knows that performances during that period warranted more than four points and a Capital One Cup exit. 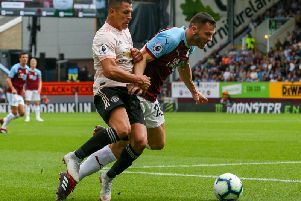 “I wouldn’t say I’m scratching the surface of their potential because I think we’re delivering good performances - some better than others,” said Dyche. “I feel that we’ve been deserving of a win before these two wins came. Outside opinion is what it is - we know we’re the underdogs, we know people have and are questioning us. Dyche added: “We’re not interested in proving doubters wrong; we’re more interested in proving ourselves right. We believe in the way we work, so do the players, and it’s important that we have faith in that. The Clarets got their reward with back-to-back wins against Hull City at Turf Moor and Stoke City at the Britannia Stadium. Now Dyche is ready for the next challenge when Aston Villa visit East Lancashire on Saturday, kick-off 3 p.m.
“The mood has been positive all season,” said Dyche. “We know the challenge in front of us. All it does is enhance the feeling because players are obviously designed to win - that’s what they want to do. It does enhance it but I think we’ve been positive all season with the way we go about our business. “We just look at it and think this is another tough two Premier League games (against Villa and Newcastle United on Tuesday evening). They’re at home which is favourable and we love playing at home.